London Heathrow Airport. Photo via Google. July 13, 2017. © Leeham Co.: If you thought the US government ban on carrying electronic devices on board airliners in the name of heightened security was bad, that was going to be a minor inconvenience compared with what is in the works, LNC has learned. The US Department of Homeland Security may announce as soon as next week a series of revisions to check-in procedures outside the US that will set the airline world back 30 years. An international carrier advised LNC of the following, revised procedures DHS has notified it that will be put in place between now and October. Kiosk and on-line check-in for inbound international passengers will be out. If the answers are deemed sufficiently high-risk, the passenger will be separated from his/her party — even if traveling with children for high-intensity screening in a separate holding area at the gate. The passenger will not be allowed to rejoin or communicate with the rest of the party until after boarding the aircraft. One hundred percent of US-bound passengers will have their carry-on bags swiped for explosive particles, just like TSA does randomly today. Once announced, the new measures take effect within 21 days through October, LNC is told. ITS NOT NEW- at least in Israel- had those and other questions asked in 1986-87 when flying to and from israel via amsterdam. In Israel – they then asked ‘ do you know why we ask these questions ? I hesitated to say or use the word ‘ bomb’ when I started to answer. He answered – to be clear- people have been know to give toursists a gift package to take to and ibstead it contaqins a bomb. Visual checkm of luggage as to was it packed just the way you did this am in your hotel, etc. Yep, sounds like more dish of the day anti-Trump mania. CNN will probably claim it was Putin’s idea. There’s nothing to fear, ..except a whole lot of bankrupt airlines that can’t manage their finances properly and have been led into costly, unnecessary expansion as we saw with Norwegian… yeah there’s plenty to fear, but what can you do. Honestly, should Israel really be used as a benchmark here? Having traveled through Ben Gurion before, I fail to see how the security “show” is supposed to really detract someone. Firstly, none of the information you provide is actually cross-checked with anything. I just see detached officers having to rant the same questions over and over again; I’m not certain how, with decreasing attention span over a long shift, effectiveness can be sustained. Secondly, if you look at the age of the people there(mid 20s), one can also assume that not all of them have had long-term experience/training in the assessment of body language. So, is sustaining such a large non-/partially specialist workforce really cost-effective and correlated to actual detection rates _on site_ in the airport? Thirdly, what should also be considered, is that there is a sizable share of transit passengers travelling through US hubs who have no intention to stay in the country. For such paying customers, ESTA is already a hassle (which-with the concludent waiver of all rights to appeal DHS officers verdicts- is a huge risk detractor to those who just want to transit to their vacation). With electronic check-in going away, this just adds another reason to stay clear of US airlines. Back to your original example: If you had a choice, would you rather transit through TLV, or rather places with equally effective safety records but less imposing atmosphere (like f.e. MUC, DXB, SIN)? DHS should consider that there is also an entire industry and many other stakeholders to facilitate an effective travel environment for. It goes beyond catering to the plain paranoid who are contempt with wasting everyone’s time with security screens and interrogations. And the last time an el al plane was hi jacked was ?? granted a lot is for show- few knout what background checks have been made even before you board to or from. granted that with a smaller number of flights compased to U.S or ?? such things as profiling can more easily be accomplished. And as to age of ‘ flight and check in staff- dont be decieved. Its a good bet that all have seved in the militay or are serving in military organizations. I’ll suggest there is MUCH more than obvious going on that you and 99 percent of tourists are aware of. BTW- did they stamp your passport when you entered . I’ll bet not. Do you know why ? Have you ever applied for a visa to jordan or syria or ?? ( mid east) – and have you ever been to occupied palestine ? Yes, I know why they put in a paper slip. All the scenarios you mention in your questions are the reason why I have multiple passports. Like many Israelis even who don’t mind travelling to ??? as you put it 😉 -But this is off-topic. Regarding reading body language perception, it is my presumption that the regular training that conscripts receive doesn’t fully equate to or at least place comparable emphasis on the matter that psychiatry/behavior science curricula would. So to return to the topic, I’m certain that an agency like the DHS has access to such experienced specialists in this regard, but placing all of them into the screening workforce would be cost-prohibitive for the airport and the agency. Likely, these costs then end up with the traveler, which brings me back to the competitiveness argument of the transit hub and airline. I prefer a hassle-free and time saving transit, so any airline with the according reputation of El Al (your example) is far away from my top choice. And to the individual employee, being posted in such a position is highly unrewarding and a needless exposure to be the open public. Concurrently, the long hours and high incidence of screening subjects likely makes such specialists more prone to fatigue and consequentially Type I errors. Any airport operation needs to contrast the incidence rate and impact of these false-positives to the probability of risk incurrence. And with regard to sky-jacking as you mentioned, well, I can’t recall a case for many years -globally. 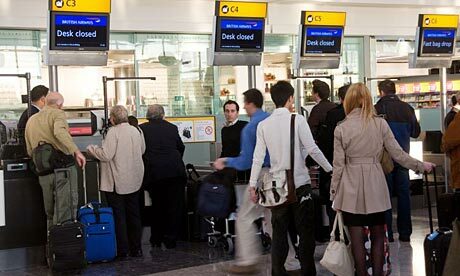 So is an Israeli-style airport screening a proportionate application of national security budget? Can it avert other important risks -like flammable materials going off inside a cargo hold, or a suicidal pilot-? IMHO, the pro-arguments to these questions are quite weak, at least for most places in the world, -including the US. The money and staff resources can be spent better elsewhere and the hassle to the innocent & paying public can be averted. Got those exact same questions in AMS last month, and several times earlier this year. No big deal. Getting rid of electronic check-in via mobile and/or kiosk, however…get to the airport early, folks. Get to the airport early, and pay more for the ticket also. Check in will cost the airline more, and they’ll pass that cost on. Prices go up and down all the time, it’s impossible to attribute price changes to any specific thing. If it costs the airlines more, it will cost the customers more. It’s about the only thing one can guarantee in an industry with slim margins. It’s just another component of the ticket price. I’m pretty certain I’m regularly, or nearly always asked this at bag drop anyway. Presumably the difference with this is that if you give a shifty answer there’s an expensive procedure to follow. Just imagine the cost; they have to have an appropriate carer available immediately to deal with children cut off from their parent, etc. That kind of standby staff is not free. One wonders what was supposed to happen previously. Coming back to the U.S. from Europe and Asia ( except Japan ) this has been standard since way back when, before 9/11 even. I’ve got asked these questions when TWA was still flying to FRA. Laptop ban backfires. Now this. The airlines that will be hurt hardest again are the ME carriers with their multi departures in VLA. Not to speak of other carriers worldwide. If Airports around the world unite and limit US airlines to one working check-in desk per airline then this too shall fail. Very quickly I’d have thought. Anyone else feel these measures are about something else and not security? Trouble is, I can’t think what else it’s about. I really don’t see how being asked these questions by a human rather than a computer screen increases security in the slightest. All it does achieve is making travel to the US somewhat less attractive. Being a bit hyperbolic aren’t we? I don’t recall kiosk or online check-in back in 1987. Are you just willfully missing the point? Because we didn’t have those things in 1987, removing those options for checking in will send us back to what things were like for checking in back in 1987. 1987. No internet no mobile networks no fibre networks. Yep let’s go back! 1970, pagers ( sort of like cell phone with limited to one number calling, 1980’s fiber optics intrA net, and corporate approx of skype via fiber and or microwave. So I am traveling to Europe. For the first time not through the USA. The costs to the US travel industry will be significant and long term. I am sad about that. President Trump and General Kelly are doing a great job. They understand the threat and are acting appropriately. If it creates inconvenience to the airlines and passengers so be it. Lots and lots of bitching and moaning here, but not one real peep about the ramifications of an airliner bomb takedown. Same with the laptop ban. Just remember, a single major British, French, ME or US airliner takedown, and it’s point, set, match, terrorists. These airlines can then try on 25% to 45% occupancy rates for a while. And the next airline passenger mode will “Israeli style”, or in skivvies and cotton bathrobes–for everyone! Exactly. I must say I agree with many above, but in general this site has the most entertaining comments. It does make me laugh, I have just come through Geneva airport, they have a lovely shop there selling Swiss army pen knives , I kid you not! There is a specific Victorinox pen knife shop is Zurich airport too! They have lovely instructions telling how they are only fine on direct flight (as they know the security if you connect will go mental). Did they also sell ceramic knives? Why would you need ceramic? The shop was airside, so no security concerns, and it’s only a 4″ blade after all!